My ewes are shorn in December each year and I have a considerable range of natural colours available. My rams are shorn in the spring. I will have fleeces for sale at the Wool & Willow Festival, Llanidloes, 2nd to 30th June 2018 and Wonderwool Wales on 27th/28th April 2019 at the Royal Welsh Showground, Builth Wells. If you can't get to the shows don't worry because I normally have plenty of fleeces available at home. These can be sent to you via MyHermes couriers at very reasonable rates or you can call at the farm. Please phone or email to discuss your requirements. My 'Links' page will give you the website addresses of Wonderwool Wales and the Wool & Willow Festival. The 'Wool and Willow Festival' at the Minerva Arts Centre, Llanidloes, runs from 2nd June to 30th June 2018, open 7 days a week and admission is free. 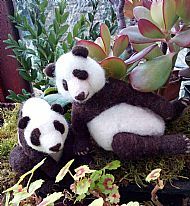 I will be running a needlefelting workshop at the festival, making a cute little Badger on Sunday 10th June. Details will be available on the W & W Festival website. This year the Festival will once again be hosting scrumptious stands showcasing all manner of textile and willow related goods. Makers from all over Wales and the Borders feature at the Wool and Willow Festival so do drop in to the Minerva Arts Centre in the picturesque town of Llanidloes, Powys, Mid Wales. One of my specialities is needlefelted Illuminated Lettering on wall hangings and bags, an example is shown at the top of the page. Please contact me if you are interested in having a bag or picture made with your personalised initials. The 8th WORLD CONGRESS ON COLOURED SHEEP has now taken place and it was a wide ranging and enlightening event. The venue was Paris with a visit to Rambouillet followed by a tour of sheepy things all over France. If you are at all interested in coloured sheep or their wool you will find this a most enjoyable event with a social side as well as the serious stuff. Start saving now for the next congress which will be held in Italy in 2019. If you would like some beautiful coloured sheep of your own, I have a few Corriedale ewes and rams for sale. If you or your group would like to book a needle felting workshop at the farm or at your own venue, please get in touch to discuss your requirements.